Build habits, get inspired, live fresh. 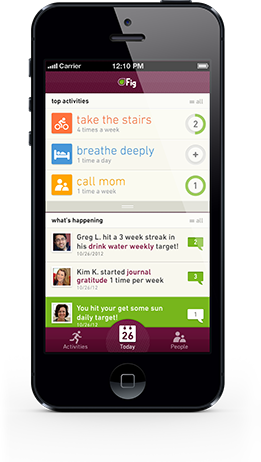 For five years, the Fig app has continued to become the industry standard in personal wellness habits. We started Fig to make wellness reachable. First we surveyed the latest research on behavior change. Then we started running experiments of our own (over 50,000 people) to become more effective at catalyzing behavior change. Today we continue to learn and improve our healthy habits platform from serving every individual to large organizations and their employees. Fig helps friends support each other with camaraderie, practical help, encouragement, and accountability. You're more likely to go for a walking break when you and three of your work buddies realize that you're all aiming to take a desk break every afternoon. Or when you see that your married friends John and Julie haven't had a date night in 6 weeks, you can assist them by offering to babysit this weekend. You can encourage and support each other on one activity or many! For a refreshing way to approach health look to Fig — a personal and holistic wellness guide that goes beyond diet and exercise. The app allows users to create a personalized plan focused around whatever they believe defines better health: whether that’s lifting weights, skipping the breadbasket, or even calling mom. Fig was created by a Palo Alto-based team that believes overall wellness depends on great nutrition, sufficient sleep, healthy relationships and other factors unique to each of us. Users are encouraged to start off small by setting mini personal goals on Fig. They can be daily, weekly or monthly goals — whatever makes you feel good. Simply add an activity you want to complete to you day, and check it off as you do it. The goal is to give you a better overall view of your day so you can see how your activities relate to each other. For the socially minded, you can also cheer on friends or share your day with others, but it's not required.